On Monday, March 11, I’ll be a plenary speaker at the Virginia Association of Museums conference to discuss the trends, challenges, and opportunities facing historic house museums. It will be followed by a forum with historic site managers, tourism experts, preservationists, and community leaders on the needs and opportunities for historic sites in Virginia, such as a statewide association for historic house museums. It’s great timing for this topic: Governor McDonnell declared 2013 as the Year of the Virginia Historic Home in recognition of the bicentennial of the Executive Mansion and Virginia’s more than 100 historic homes, most of which are open to the public as museums and historic sites. Whenever I’m asked to give a presentation or write an article, it’s an opportunity to do some research and reading to gains some new or deeper perspectives on the issue. For the VAM presentation, I’ve been looking closely at the Survey of Public Participation in the Arts by the National Endowment of the Arts. For decades, NEA has interviewed thousands of people across the United States to learn about their involvement in music, art, theater, festivals, reading, and dance. NEA conducted the last survey in 2008 and published a series of analytical reports in 2009-2011. Looking back over 30 years, the survey confirms that attendance closely correlates with years of formal education: “people with higher levels of education are more likely to attend.” No surprise there, but it also shows that adults whose parents have relatively high levels of education are more likely to attend arts programming. Now here’s the strange news: “the largest percentage point declines in attendance were for people with the most education.” In 2002, three-quarters of people with a graduate education attended an arts program but in 2008, it dropped to only two-thirds. Much of the overall decrease is due to people who were 35 to 54 years old in 2008–the older generation of Baby Boomers are still going strong and actively participating. So what does a national arts survey have to do with historic sites? Happily, there’s one question that asks, “During the last 12 months, did you or your spouse/partner visit a historic park or monument, or tour buildings or neighborhoods for their historic or design value?” Okay, it’s a bit cumbersome and I probably wouldn’t ask the question this way, but it seems to be the only one that relates to historic sites in a longterm scientific national survey. 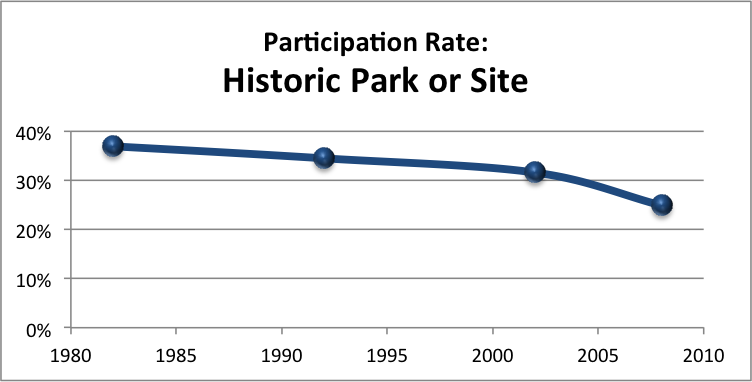 Participation rates at historic sites, 1980-2010. Source: Survey of Public Participation in the Arts, NEA. Unfortunately, the overall trends for historic sites are headed downward. Although nearly 56 million people visited historic sites in 2008, it’s down from a high of nearly 65 million in 2002. But as a percentage of the total growing population of the United States, the participation rates have steadily fallen since 1982, perhaps even accelerating. We’re not alone, however. The survey show similar declines in music, dance, craft fairs, sporting events, and even gardening. To see if there are any discernable patterns or correlations, I’m doing my own analysis of the dataset. I’ll know more later this week, but so far I’ve found that participation rates vary widely by location. Participation rates for historic sites exceed 40 percent or more in Alaska, Georgia, New Mexico, South Dakota, Utah, and Vermont and fall below 15 percent in Louisiana, Mississippi, and Oklahoma. It’s often helpful to look at the extremes to identify patterns, but in this case, there seems to be nothing obvious that connects them (e.g., they’re not all in the New England). It looks like I’ll have to dig deeper into the data and perhaps I’ll find something. 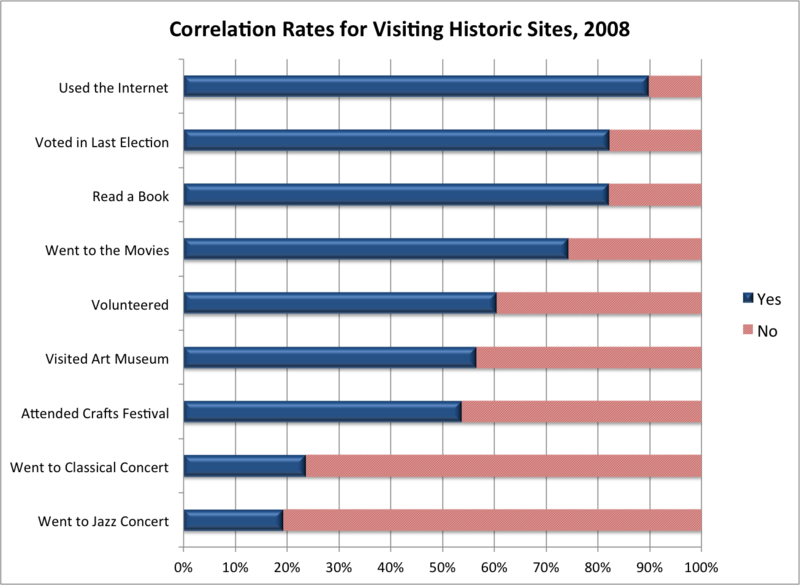 Correlation between visiting historic sites and other behaviors. Source: NEA Survey of Public Participation in the Arts, 2008. Elsewhere, I compared the habits of people who visited historic sites to those who didn’t. It seems that people who used the Internet, voted in the last presidential election, and read a book are much more likely to visit an historic site than people who attended a jazz concert, art museum, or a crafts festival. That was a surprising result to me because when I worked at the Homestead Museum, we hosted popular crafts festivals and jazz concerts (but now I have to think back a decade–did they go into the house or just stay outside??). Although this work is preliminary, it may provoke some thoughts about patterns at your site and whether you’re following national trends or not. I’ll share more discoveries as I find them. This entry was posted in Community engagement, Performance measures, Resources, Uncategorized and tagged National Endowment for the Arts, Survey of Public Participation in the Arts, Virginia Association of Museums on March 5, 2013 by Max van Balgooy. Nice blog Max–is there any data regarding the correlation between folks who visited outdoor venues (hiking, nature, biking, etc) and historic sites? There is a surprising study on this very topic. In 2005, the Greater Philadelphia Tourism Marketing Corporation published a research report called, “Think Outside: Promoting Natural Assets and Experiences in the Philadelphia Region.” It showed that the top three things that outdoor enthusiasts like to do are walking, jogging, and visiting historic sites. Who would have guessed? I wonder if historic site in this case refers to a museum (indoor site) or more likely an outdoor battle field. Thanks! Reach Advisors is a good source for learning more about visitors and along the blog you mentioned, their 2009 book, “Life Stages of a Museum Visitor” is thought-provoking. Great post and analysis…look forward to hearing more and being part of your session this weekend at VAM! Max, Great post! I was especially interested in the chart relating visiting historic sites and behaviors. Am I the only one out there that sees using the internet, voting, reading, and volunteering as being more active human activities than the passive reception of music? I am not in any way being critical of music – not in the least. I am just wondering if it takes a more active personality to visit a historic site.